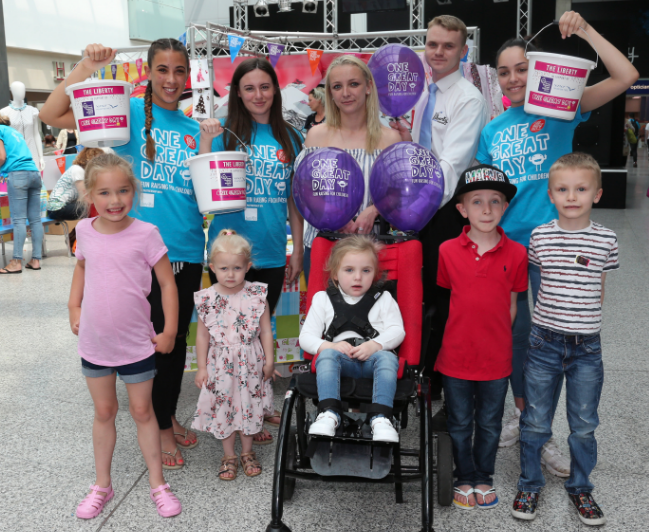 Shoppers at The Liberty displayed their generosity during ‘One Great Day’ of fashion and fundraising on Friday 2nd June, which raised over £600 to support a local child and Great Ormond Street Hospital. Shoppers were encouraged to get involved in a number of exciting half-term activities that included fashion design workshops and bungee trampolining, all in support for local child and Rett Syndrome sufferer, Lottie McCarron and Great Ormond Street Hospital. In 2015, three-year-old Lottie, the niece of Lee Nash, Security Controller at The Liberty, was diagnosed with a rare genetic disorder called Rett Syndrome that left her unable to communicate. Since then, family and friends have been continually fundraising to hit a £15,000 target that will enable Lottie to get an eye gaze computer which will enable her to communicate to those close to her. Support for the worthy cause flooded in while customers at The Liberty, shopped, sketched their ideal summer outfits and had fun on its bungee trampoline. Centre Manager at The Liberty, Jonathan Poole commented: “Here at The Liberty we have been overwhelmed with the support that shoppers have shown for our recent events. Lottie’s Uncle, Lee Nash, added: “It was an amazing day and the family and I are so thankful for those who took the time to help support Lottie’s campaign.